This tip been mentioned on the blog many times before, but I wanted to highlight my experience this week as a Feature Friday post! The Boston Public Library offers free and discount museum passes to many local attractions in Boston and more with your Boston Library card. Any Massachusetts resident can become a BPL cardholder. I went to a local branch with my Massachusetts ID and received my BPL card in a matter of minutes. 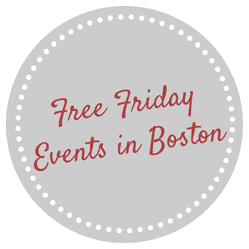 Your Boston Library Card can give you free admission and discount admission to many different museums and attractions in the Boston area. For more details about the various discounts and more, please head here. In order to request a museum pass online, you need to enter your library bar code which is the set of numbers on your BPL card. You also need to enter a pin number which is a personal pin number created by you. If you forgot your bar code, just hit the forgot pin number button that appears. Once you enter your information for the pass you want, that’s it. You just need to head to the library that you picked to grab the pass. 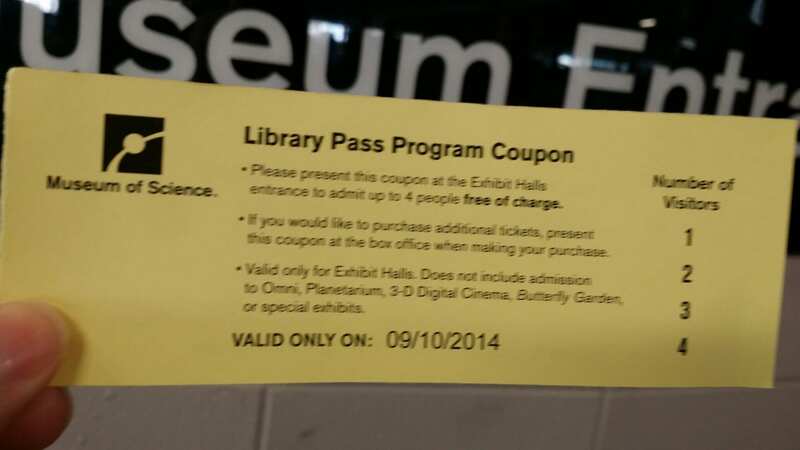 I took advantage of free admission to the Museum of Science for up to 4 guests with my BPL card. It took a few minutes to request the pass online and about 5-10 minutes extra to stop at the library before heading to the Museum of Science. If I didn’t request the library passes, I would have spent $92 at the Museum of Science for admission for myself and 3 guests. Pretty great deal. I didn’t need to wait in line to exchange the pass for tickets and just needed to hand the usher my library pass at MOS. However, your experience may vary on museum and library pass. As mentioned, any Massachusetts resident can take advantage of this offer, but you do need to be present to pick up the museum pass at a Boston library. 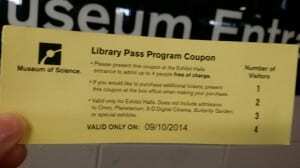 However, your local library in your own town may also offer similar (or better) local discounts to your favorite attractions. For more information and all terms, please head here. Have you taken advantage of your BPL card for free museum passes before? How was your experience? Feature Friday: College Student Discounts and Savings! I know I am no longer a college student, but I wanted college discounts and savings to be highlighted as a Feature Friday post this week. One of my favorite ways to save money in college was to get involved and take advantage of so many free student activities. Free comedians, free coffeehouses with musicians, free game shows with awesome prizes, free food and much more are available constantly through your college. Make sure to follow your local Student Activities department on Twitter or Facebook to stay connected. Free Entertainment is definitely a great college perk and you don’t have to go too far for it. Also, if you get involved in clubs and organizations, you may also receive free perks, swag, free food at meetings, etc. It’s also a great way to meet new people too. If you are looking to get off campus, your college ID card is a great way to save money too. There are so many local restaurants, attractions, retailers and more that will give college students a discount with a valid college ID. Often times college discounts are not advertised so make sure to ask if they have any discounts for college students. 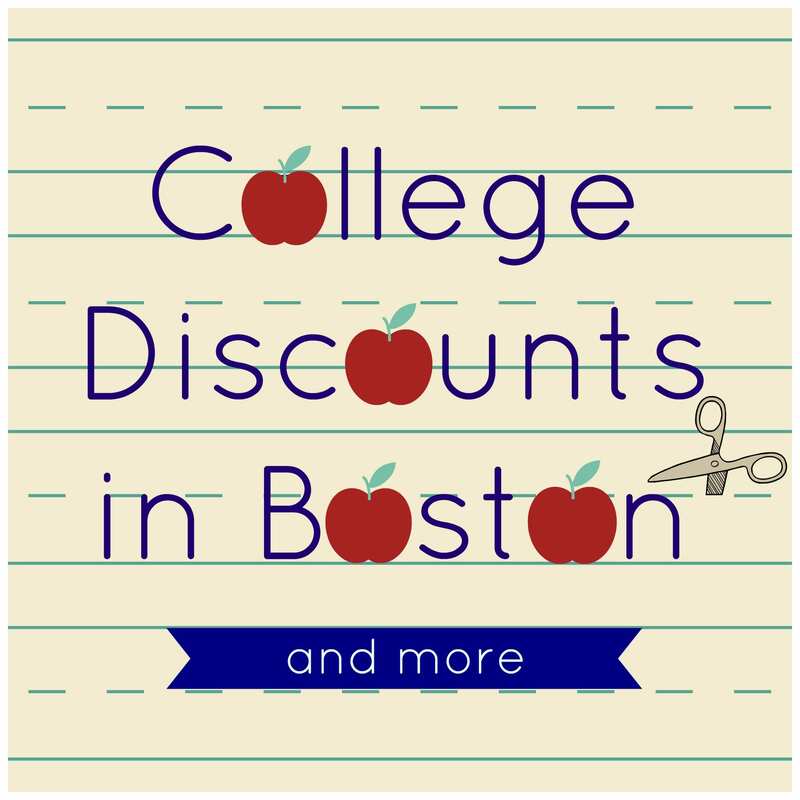 There are also many college discounts that are advertised and I compiled a list of them all in Boston as well as national deals too. 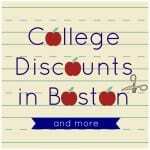 All college discounts in Boston and beyond can be found here and make sure to leave a comment if I missed anything. What is your favorite college discount? Castle Island is a 22-acre park located in South Boston and connected to mainland. Castle Island is also home to Fort Independence, a granite fort, available for tours during select times. 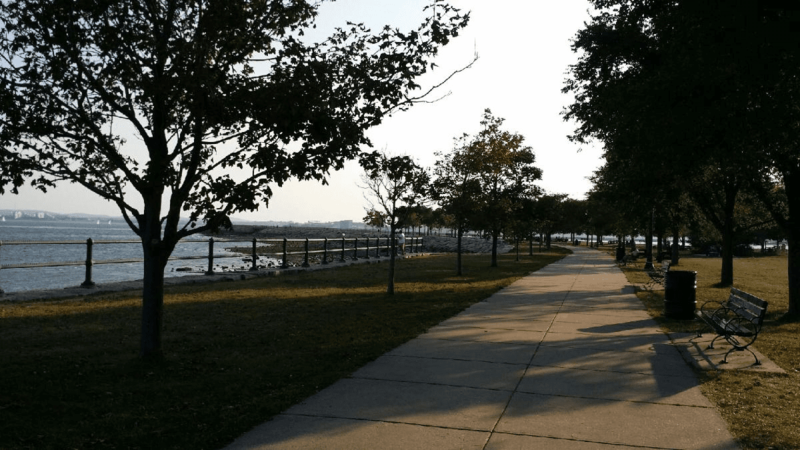 There is so much to do at Castle Island for free from walking, biking, swimming, airplane watching, and much more. My dog Connie loves Castle Island! Food and grills are also allowed, which makes for a great and budget-friendly meal. If you don’t feel like bringing food, Sullivan’s is at Castle Island is available for food and isn’t too expensive. There is also a parking lot which offers free parking if you do decide to drive to Castle Island. The MBTA Bus Route 5, 7, 9, 10, or 11 will also . For more information about Castle Island, please visit here. Every week I feature different aspects of saving money in Boston with something I have done or do regularly. I wanted to highlight how I grocery shop this week for the Feature Friday post. I probably could write a series or a whole book of how I grocery shop, but that would be pretty boring so I’ll stick to a few main points. First things first, I do not shop at the same grocery store every week and I do not shop at the cheapest grocery store. 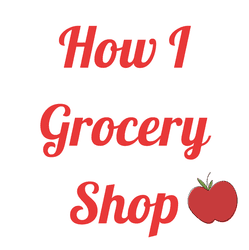 However, I try to shop at the cheapest grocery store for me that week, and try to stick to my $40 weekly grocery budget for a family of two and a dog. 1. Know how to recognize a good price: This is really important. How can you possibly know if you are getting a good deal if you do not know what the price is at other stores or the regular price? Make a list of items that you buy regularly and figure out what the price is at different stores and different type of stores. Canned Tomatoes may be on sale from $1.89 to $1 at Shaw’s but if you can get diced tomatoes at .89 at Target for the everyday price than the Shaw’s sales price isn’t a good deal. Also, just because you live near two grocery stores owned by the same company doesn’t mean they will have the same prices. For example, eggs are almost a dollar more at one grocery store with the same ownership, both roughly the same distance from my house, just opposite direction. However, the store that has more expensive eggs has cheaper milk. However, if I didn’t pay attention to price while I’m shopping, I may have not known these weird price differences. Pay attention to prices, and even jot down prices of common staple items to help you remember what prices are good and what aren’t. 2. Shop on sale: Just because that .89 can of Tomatoes is often cheaper than the sale price at Shaw’s, doesn’t mean I will always buy canned tomatoes at Target. I like to buy items when they are at their cheapest possible to help save money. However, if I don’t have tip #1 down, it makes it really hard to recognize a good sales price. I like to take the weekly ads of Shaw’s, Stop & Shop, Roche Bros, etc. and circle items that I need and have a good sales price. Often you will see Chicken Breast for $1.99/lb or less circled, produce like carrots or mushrooms for $1 circled and much more. After I go through the ad, I like to go on awesome local blogs like Maven of Savin or Coupon Karma to see if I missed any good deals. The nice thing about Coupon Karma is there’s a Top 10 list so you can quickly see what the best deals are that week. I like to see if I missed anything or if there’s a coupon I can use to combine with a sale item to make it even cheaper. Checking out local blogs and reading weekly matchups are a great way to learn prices and see what is and isn’t a good deal. Also, most of the work is already done, so it’s a really easy way to save money. 3. Make a grocery list and meal plan: After reading coupon blogs and my weekly ad, I make my grocery list and I meal plan. Meal planning is a great way to save money because you know exactly what items you need that week. I create my meals plans weekly based on what is on sale. If mushrooms are on sale, I may make Chicken Marsala or Beef Stronganeff depending on what items I have in my pantry or freezer. 4. Plan ahead and Stockpile: If you’ve ever seen TLC’s Extreme Couponing, you may be familiar with the term stockpiling. Basically, you buy items when they are at their absolute cheapest and stock up. You may be familiar with people buying hundreds of items for .04 and stockpiling in their basement. Although some items are extreme, the concept is really smart. You are not running out for cream of mushroom soup pre Beef Stroganoff prepping because you bought some cans at .12 during a winter stock up sale. I know having key pantry items help me meal plan better because I know I have staple items and all I need are the more expensive items like produce and meat when they go on sale. I don’t have 100’s of items of anything in my stockpile, but I do have items that I go through quickly that I can get pretty cheap during sales cycles. I often see BBQ sauce for cheap in the summer, but I often poor BBQ sauce over meat in the crock pot in the winter, so I will usually buy a few to last me through another cheap sales cycle. Plus, BBQ sauce has a long expiration date and I tend to go through them more in the winter than summer. 5. Use coupons: I will often use coupons with sale items to pay less. However, I don’t always use coupons and I only use them when it’s a great deal. Stores like Shaw’s, Stop & Shop, and Roche Bros will double coupons up to .99 so if you have a coupon for .50/1, you can save a $1 on that product. Make sure you familiarize yourself with the store’s coupon policy because every store is a little different with coupon usage. However, if you check out coupon matchups on coupon blogs mentioned in tip #2, they do the majority of the work for you, so it’s pretty easy to use coupons. Also, check in-store for coupons. The best deal I ever did at a grocery store was one I wasn’t expecting. It was chicken on markdown and it had two store coupons on it. After the store coupon on the meat, I got a pound of boneless chicken breast for .03 total! 6. Shop Around: Make sure to check prices and sales for many different stores before you decide on your few favorite places to shop. I usually only grocery shop at one grocery store per week, unless there’s a major expectation. However, sometimes I will shop at different type of stores to help save money. For example, I never buy spices for $4.49 and whatnot at the grocery store because they are $1 at Ocean State Job Lot or Christmas Tree Shop in a less fancy bottle. Also, if you can, try to buy items where they are cheaper. For example, if you live near Haymarket, trying buying your produce at Haymarket on Friday or Saturday to save money on produce. I also try to buy milk at the convenience store when I’m getting gas because it’s usually significantly cheaper. Pay attention to prices and figure out what the best place to buy items are for you and what grocery store works best for you. Please let me know if you have any specific questions about anything mentioned above. I actually shop more often at the more expensive grocery stores because there deals combined with coupons tend to be cheaper than stores with always low prices (and less busy). Again, I rarely buy items that are not on sale with the exception of a few common items like green peppers, bananas, etc. Do you have any grocery tips to share?